You can get a lot of bike for £300 these days – a fully-featured road iron or a very decent flat-barred hybrid. 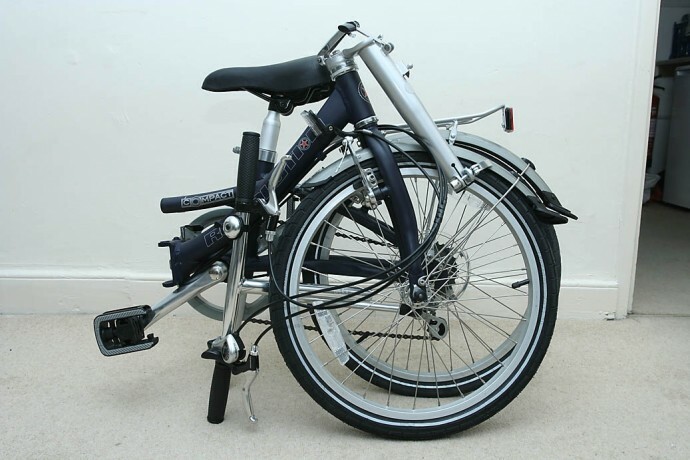 And if you want a folding bike? Well, cheap folders have always been part of the market but the Compact from Revolution is something a little bit different: a fully featured, fully kitted out, all Aluminium folder for just £279. It's a folder with a bit of class, too, built by fold-meisters Dahon and featuring locking main and stem hinges. You get folding pedals, a kickstand, a rack and mudguards, and Revolution even throw in a bag too – how's that for value? First impressions are very good. The frame is well-made and neatly finished in a matt dark blue. The main hinge is a chunky affair and shuts with a reassuring click, and there's a second beam above the hinge that braces across the fold and helps to spread forces through the frame. The Aluminium fork is mated with an extendable folding steerer, that again features a fairly foolproof locking hinge, and it's nice to have an adjustable height bar on a machine at this price. Shimano EZ-Fire takes charge of the shifting duties and it's a very functional system, even if the trigger/button integrated shifter is a bit ergonomically challenged. Six speeds isn't the biggest range, and the Compact is fairly easy to spin out on the flat, but it's nippy away from the lights and capable of climbing some steep hills. Where the Revolution really scores is comfort. It's a really comfy bike to ride. That long seatpost and steerer do a great deal to dissipate shock, and they do it without feeling overly flexy. Okay you wouldn't want to sprint to catch your train, and there's a bit of sideways movement in the 'bars, but you're getting an very rideable bike for your money. It's especially good around town – nimble and well suited to traffic dodging. The tyres are decent rather than good, and the wheels are a bit heavy (though their small size makes the extra weight less noticeable) but they'll cope with plenty of abuse, as will most of the kit on the bike. So on to integrated transport: how does it fare when folded? Well the fold is straightforward – flip the 'bars down, unlock the main hinge and drop the seatpost. 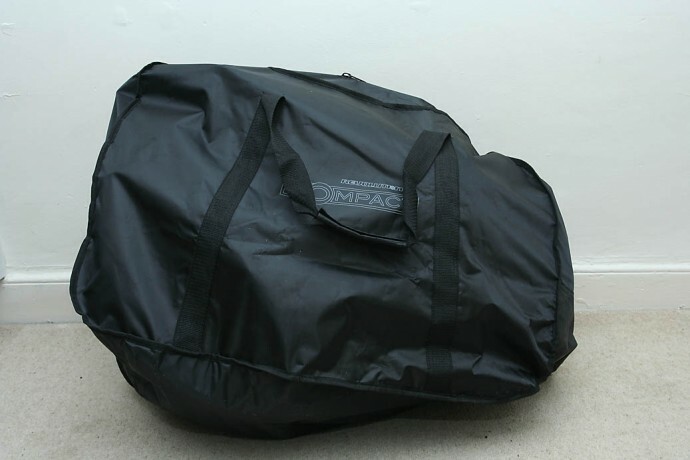 The resulting package is small enough to stow away on a bus with only a minimum of filthy looks from other 'inconvenienced' travellers (it sticks out a bit), and it's fine on the train; it'll also fit into the boot of pretty much any normal-sized car. The only downside is the overall weight of the bike. At 13kg it's certainly no lightweight and you do feel it when lugging the Compact around, much more so than when you're riding. It's better when you stick it in the bag supplied but it's a Sysiphean ordeal to get it in there; for every bit you stuff in another one will poke out. The bag could definitely do with being a bit bigger. Other kit is great for the money. The plastic folding pedals don't last in our experience but they're fine while they do. The mudguards and rack are well made, and the kickstand is the same one you'll find on folding bikes costing twice as much. The saddle is best described as a 'comfort' model but it's fine for the short hops the Compact is designed for. Overall the Revolution is a very likeable bike, punching well above its price bracket. The weight's a bit of an issue, especially for lighter-built riders, but there's no mistaking the quality ride and solid feel of the bike as a whole. To get such a good package together in these days of currency meltdown is a grand job, and the Compact upholds Edinburgh's reputation for producing quality bikes at the lower end of the market. It's a cheap folder but not a no-frills one: you get rack, mudguards, folding pedals and even a transit back for less than £300. For someone looking at making their commute cheaper it's an excellent option. The Revolution bikes are built by Dahon and although they don't necessarily use Dahon's most up-to-date folding mechanisms everything works perfectly and the frame is well built, well finished and well aligned. Sit up and beg, as you would expect. The smaller the rider the more upright the position tends to be, although the 'bars are height adjustable which is good spec for the money. It's a little flexy in the stem, especially when fully extended, and there's a bit of side-to-side movement in the 'bars even when done up tightly. Other than that it's very good considering the design. You'll want to be sitting down, and the upright position doesn't favour big efforts. But for what it it, it's pretty efficient.